You may want to discuss with your students the changes that humans have caused to landscapes around the world. Here, the importation of a single species of fungus has had tremendous impact on forests over the eastern third of the United States. How would these forests be different if the parasite had never arrived? What effects would there have been on the populations of birds and mammals that fed on chestnuts -- and on the animals that preyed on those species? Until the early 20th century, the American chestnut (Castanea dentata) was one of the dominant tree species in many Eastern US forests, accounting for as much as 30-40% of the tree cover in some forests. In 1904, however, a fungal blight was discovered on chestnuts in New York City. The fungus, Cryphonectria parasitica, appears to have been brought into the US on Asian chestnut nursery stock. Although Asian chestnuts are largely immune to the fungus, the blight is almost invariably deadly to the American species. 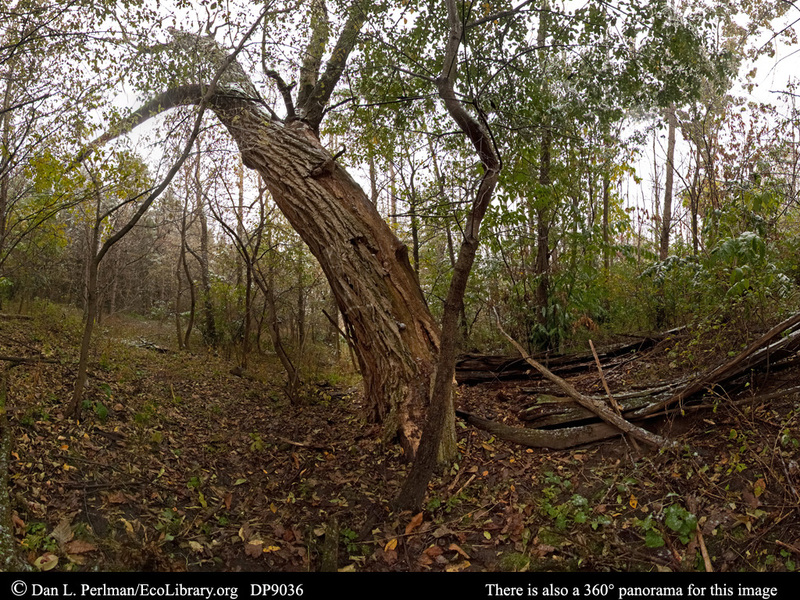 Within a few decades virtually all mature American chestnut trees were dead, although they keep sprouting from the root stocks. In the last years of the 19th century, shortly before the blight arrived, a farmer in West Salem, Wisconsin planted almost a dozen American chestnut trees on his property, outside the natural range of the American chestnut. Isolated from the blight, this small population flourished and by the late 20th century there were about 6,000 chestnut saplings and mature trees on the property. Unfortunately, by the time I visited the site in 2009, nearly all of the large chestnuts that I saw had contracted the blight and were dead. The large dead chestnut in this image has a diameter of at least 30in (over 70cm), and many stump sprouts can be seen growing around dead chestnut trees.